Trendy Mannequin. : It Takes Years To Recover the Nail Technicians' Course Fee' In India. It Takes Years To Recover the Nail Technicians' Course Fee' In India. I'm not a person who reads the newspaper daily. Well you can't blame me. I would prefer finishing a 400 pages novel than reading 12 depressing black and white pages of the happenings of the world. But when one specific article caught my eyes, I made sure that from now on newspaper is gonna be a must read. It's always assumed that India is a place which is backward and filled with hypocrites. Believe me this was old story. India is a place where you can now pursue whichever career you want. But after reading and researching about the situation of the Indian market of nails, my views changed about India. 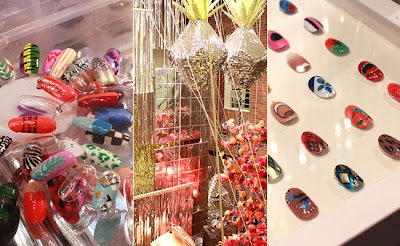 Those of you who are planning to take up nail art as their profession remember there's more to the pretty designs and the clacky nails. Nail art of today's world is now leading to a new place where you're gonna be treated like a maid. This international concept makes me wonder why there is so much of problem in India where girls from different states are hired in nail bars and kept in nail dust for hours harming their health. Along with that, studies show that the fanciest of nail art stores in malls have the filthiest cleaning departments and no facilities of fire exits. Also, there are no periodic checks on these saloons which should be made a must. If asked for better pay checks or less working hours, the girls are treated unjustly and shoved off to continue with their work. When the girls were interviewed, they revealed the backstage story of these stores that many times the poor girls are regarded as lesser mortals. After spending 2-3 hours working with perfect concentration on the customer's hands, the employees don't get an appreciation or a word of thanks in return. The starting salary is $78.90-$94.68 which is not enough. If the employees agree to work extra for an hour, they don't get more than $15.78. How can a person survive with this much of money in India? If you have to pay the rent for a house or food money, then you can barely make ends meet. I love India, its not only because I look like an Indian as my family and friends says.. But I love your country, the people are so beautiful! I hope I can go there someday! Hahaha, India is a very surprising country as a matter of fact.